The Rooftop Gardens is set to launch at The Courthouse in Cheshire. The Rooftop Gardens will be a sun terrace by day, serving seasonal small plates and afternoon tea and an elegant champagne and cocktail bar by night. The Rooftop Gardens has been in planning since The Courthouse launched in 2017 and will officially open to the public on 28 July 2018. Located in the heart of the historic Cheshire town of Knutsford, The Courthouse is an impressive Grade II listed building. Designed by George Moneypenny and built in 1818, the building was the former home of Knutsford Crown Court. The magnificent Georgian property has been sensitively restored by local, family-run hotel group, Flat Cap Hotels, into the area’s newest and most stylish events space. The Courthouse celebrates its 200th anniversary this summer with the launch of the eagerly-anticipated Rooftop Gardens. Flat Cap Hotels has transformed an area at the rear of the property into a breathtaking terrace facing the setting sun, with enviable views across the picturesque town and the perfect Instagram backdrop. 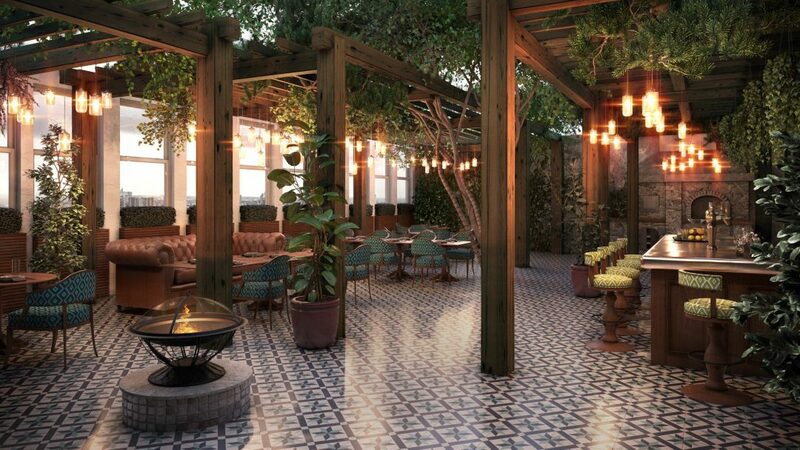 Designed by owners, Dominic and Oliver Heywood, with furniture from Ikon Furniture in Manchester, The Rooftop Gardens will be an oasis of seasonal flowers, fragrant pots and plants. There will also be a chef’s garden with specially selected botanical herbs for use in bespoke cocktails and seasonal dishes. The Gardens will be open from 11am until midnight seven days a week. From 11, staff will be serving a selection of loose leaf teas by Tea from the Manor and Arabica coffee from local company, Jaunty Goat. The Courthouse’s famous afternoon tea will also be served daily. Open for all-day dining, the Rooftop Gardens will be offering an exclusive menu created by Executive Chef, Steven Tuke. With the majority of ingredients sourced from within a 50-mile radius, guests can enjoy a selection of British seasonal small plates including light salads, sharing platters, meats from the Inka Grill, traditional burgers, pizettas from the clay based oven, market fish and steak of the day. Fish is sustainably sourced from My Fish Company in Fleetwood, the beef which is supplied by artisan butcher, Glynn Bros, is 100% grass fed from cattle raised in England or Wales. It is hung for a minimum of 21 days and then matured locally. Potatoes are locally grown by the Massey family, just 25 minutes from the Courthouse. By night, the Rooftop Gardens will be transformed in to a stylish champagne and cocktail bar, with a humidor and smoking terrace. There will be a large selection of gins, whiskies and international wines on offer, as well as botanical and garden-themed signature cocktails created by the Rooftop team and exquisite champagne from Perrier Jouet. A beautiful and magical events space, the Rooftop Gardens can be booked for private parties, wedding receptions, product launches and filming events. 2018 is proving to be a busy time for the Courthouse. This summer also sees the launch of the first phase of bedrooms in the East and West wings of the magnificent property. Eleven individually designed signature bedrooms, which reflect the unique history and character of the building are due to open, with a further 40 due by 2020. To celebrate the launch of The Rooftop Gardens a competition has launched to win a free night’s stay at The Courthouse, with lunch for two at The Rooftop Gardens. Competition closes 26 July at 1pm. T&C’s apply. Subject to availability. The Rooftop Gardens a Champagne Bar serving British seasonal plates launches on 28th July 2018. Eleven bedrooms will launch in summer 2018. An additional 40 bedrooms will be added at the rear of the building by 2020.